NCI provides access to degrees, certificates, credentials, internships, professional development, and non-credit educational opportunities. After countless hours in the classroom, completing projects, earning internship hours, all while maintaining family and job expectations — students at New College Institute (NCI) earned their degrees and gained credentials needed to take the next step in their careers. 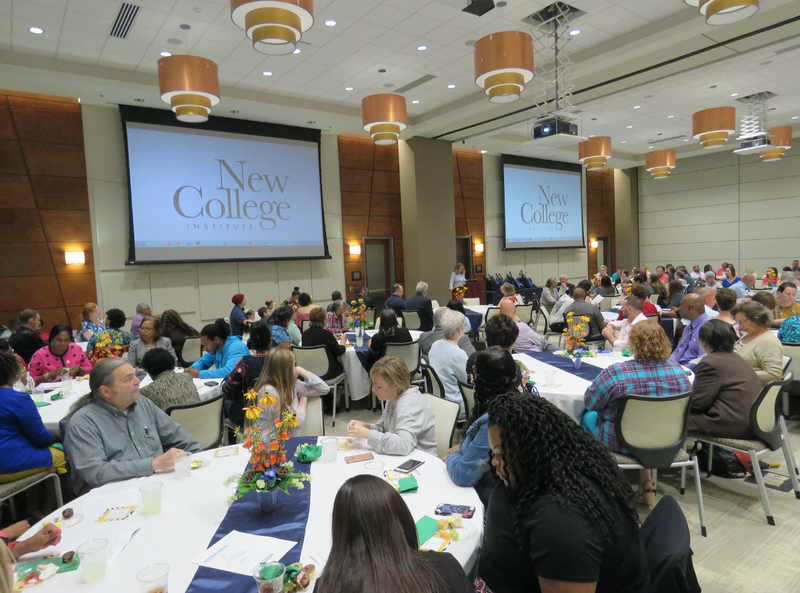 NCI celebrated the accomplishments of recent graduates at a reception with more than 125 in attendance. Graduates earned their bachelor’s or master’s degrees and all of their classes took place locally, at NCI. Those earning a Bachelor’s of Liberal Studies/Elementary Education from Longwood University include Kaitlyn Doss, Paige Martin, Taylor Morris, Megan Moxley, Drew Mullins, and Emily Sirt. Those earning a Bachelor’s of Social Work from Longwood University include Russell Betteron, Belinda Bryant, Terrance Draper, Jeanne Hodges, Elaine Janney, Melvin Johnson, Caylee Joyce, Marquita Kirby, Schnika Martin, Irbin Morales, Mary Moyer-Redd, Jasmine Pritchett, Shane Thomas, and Sarah Treadway. Janice Largen earned a Master’s in Educational Leadership from James Madison University, and Rozina Turner and Deena Collins earned certificates in Educational Leadership from James Madison University. Two of the graduates, Terrance Draper and Janice Largen, and NCI/Averett University alumnus Tim Hall addressed the crowd to share their experiences as a student and the paths that brought them to their respective programs offered through NCI. “What should I say to NCI and JMU? The only thing I should say tonight is thank you. I could not have prayed for better,” said Largen. Reflecting on his own experience while earning an Averett University Master’s in Business Administration through NCI, Tim Hall remembered his own journey and hard work that it required to go back to school. Hall acknowledged his education through NCI prepared him to step into his current role as County Administrator for Henry County. “You are not done. Come Monday morning you have a community who needs you. You have kids who need you. This community, your community needs what you bring to the table,” said Hall. Dr. Nina Huff, an adjunct faculty member in Longwood University’s elementary education program at NCI, was presented the Lula White Johnson Distinguished Teacher Award. “I’ve taught high school, college, all different ages, and they all inspire me. So, I am honored at this award. There is so much I take away from every student that I come in contact with,” said Huff. If you are interested in learning more about academic programs and service available through NCI, please call (276) 403–5610 or visit www.NewCollegeInstitute.org.